Sunny Spots program enables our children to get in touch with both their minds, bodies, and spirits, and encourages them to use all five of their senses to learn. 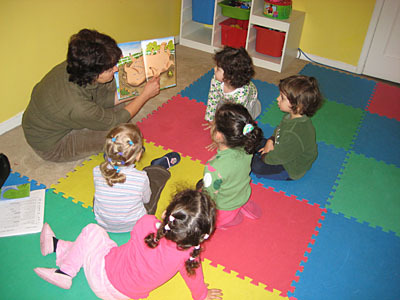 Here, we understand that small children learn by using imitation and their physical surroundings, so we make sure to incorporate this into our teaching methods. Our program is centered around building self-esteem, independence, and confidence, while letting children grow and advance at their own pace. Your child will use exploration, and experimentation to his/her benefit, and we do not let these natural instincts of a child go to waste, instead we build our program around these instincts and make learning more interesting and fun for your child. The kids play with materials that inspire exploration and pretend play, such as blocks and art supplies, as well as things such as pretend kitchen utensils and food, these activities focus on socialization and incorporate group play. – build on your child’s independence, and self esteem. – help your child learn to independently question and observe. I understand, this all sounds a bit too serious for a small child, but the main thing that we focus on, is to keep your child healthy, happy, and just let them grow at a comfortable yet rapid pace, while still letting them be a kid, and letting them have fun.